My last cookbook review was of Jamie Oliver’s 30 minute meals. Jamie’s recipes are always tasty, but he’s definitely not out to save your waistline or your heart. 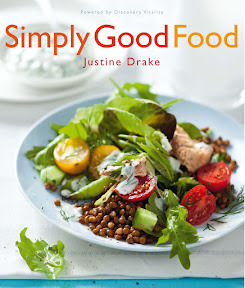 Simply Good Food by Justine Drake is out to do exactly that. The book is focused on healthy recipes and each recipe has an analysis of the calories, fat content, etc. This way you can tell exactly what you are taking in. Justine Drake has a tremendous amount of experience with healthy eating, having worked with many magazines and other aspects of the food industry. This is her fifth cookbook. The book starts with several sections dealing with the basics of healthy eating, with tips on what you should and shouldn’t be eating and why. Then there are five sections of recipes, including a section for kid friendly recipes and also a section for healthy desserts! The last section of the book is called Best Basics and is a collection of sauces, pestos and dressings but modified slightly to be healthier. Each recipe in the book has a beautiful full page picture of the dish, making every recipe look super appealing. Each recipe also has a bunch of tips relating to preparation, alternative ingredients, etc, which is very handy and informative. At the bottom of each recipe is the nutritional analysis which reveals the amount of fat, protein, carbs, calories, etc in the meal. I am a little surprised the analysis is in grams instead of a percentage. I assume the grams are related to the quantities of the ingredients specified in the recipe, which means if you modify the recipe, it’s more difficult to calculate the effect on the nutritional values. Also, it’s difficult to compare the nutritional components of different recipes because the recipes work with different quantities. The recipes are very simple and quick, so that people can start eating healthy without a massive investment in time and ingredients.I elected to make the One Pot Chicken & Mushroom Risoni (pasta rice). The recipe was easy to follow and didn’t require any fancy ingredients. I bought some chicken breasts, mushrooms and Roma tomatoes, as well as the pasta rice. The rest of the ingredients I had in my not very impressive ingredients cupboard. Some of the spices I did not have were marked as optional so I did not include them. I think the total shopping bill was about R100. The meal did not take long to prepare and it looked similar to the picture, but it wasn’t amazingly tasty and I think that’s a result of trying to keep the recipes healthy. When I say it wasn’t amazingly tasty, I mean it tasted good but cutting back on salt, oil, butter and things like that will have to affect the taste. Sometimes we forget that restaurant food is so tasty because there is a huge amount of butter/oil/salt and healthy food can’t generally compete. Although, the dessert we had at the launch of the book was the Orange Chocolate Mousse and that didn’t taste like a health version at all. These days the food we eat at restaurants is usually extremely calorie heavy so it’s a good idea to be more careful about what we eat at home and Simply Good Food is a great resource to assist with that goal. I’m looking forward to getting my paws on this book to help with my 2011 health resolutions. After all, I only have one heart and need to look after it! Quick question: Is there a large selection of vegetarian meals in this book, or are the recipes mainly meat-based?